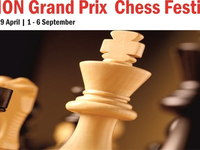 The Heraklion IT Grand Prix takes place annually since 2011 and comprises of 3 tournaments, in January, April and September of each year, in Heraklion, Crete, Greece. The 23rd Heraklion Open is the second event of the 8th Grand Prix and takes place from April 9-15, 2018, at the Galaxy Hotel. The format is a 9-round Swiss tournament, played with the standard time-control of 90 minutes for 40 moves, then 30 minutes for the rest of the game plus a 30 second bonus per move starting from move.